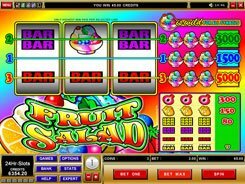 The five-reel Fruit Fiesta slot is an updated version of a classic 3-reel emulator. Here you will get the same entertainment but with enhanced graphics and new effects. 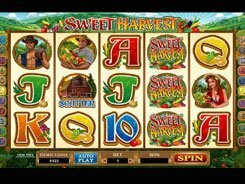 Besides, this five-reel 15-payline slot game has a progressive jackpot feature that builds up higher every time players make a bet. 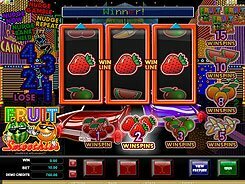 The slot employs the symbols of an apple, pineapple, melon, lemon and other fruit-themed icons. You can wager a single $0.25-value coin per line. 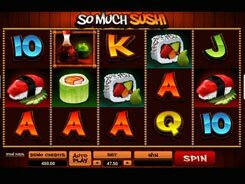 As it is in many Microgaming’s slots, a wild symbol is represented by the game’s logo. A wild can substitute for other regular images, but its key advantage is that five of a kind hit a progressive jackpot! 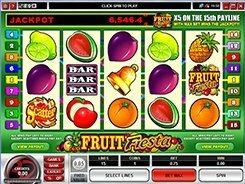 Get five Fruit Fiesta icons displaying along payline #15 while betting max, and take down a mind-boggling progressive jackpot. If the aforementioned combo appears on other paylines, you get a fixed payout. A scatter can occur in any position to win. Get 3+ of these symbols to earn some cash prizes. 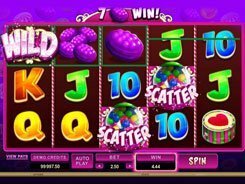 Besides the progressive jackpot, the slot machine has a fixed top payout of 9000 coins.